Some months after its establishment in May 2016, the Islamic State affiliate Jaysh Khalid bin al-Waleed was rocked by internal strife following the assassination of its first amir Abu Hashim al-Shami (aka Abu Hashim al-Idlibi) in October 2016, as the organization's security apparatus arrested multiple individuals who had been associated with the top leadership of what was Liwa Shuhada' al-Yarmouk, most notably the Afghan jihad veteran Abu Obeida Qahtan and al-Khal's brother Nidhal al-Baridi. These men, who are named in the document, had all been executed by the summer of 2017. However, given the organization's ties with the Islamic State, it is impossible that the case could have been overlooked by the Islamic State, particularly in light of the seriousness of the charges. 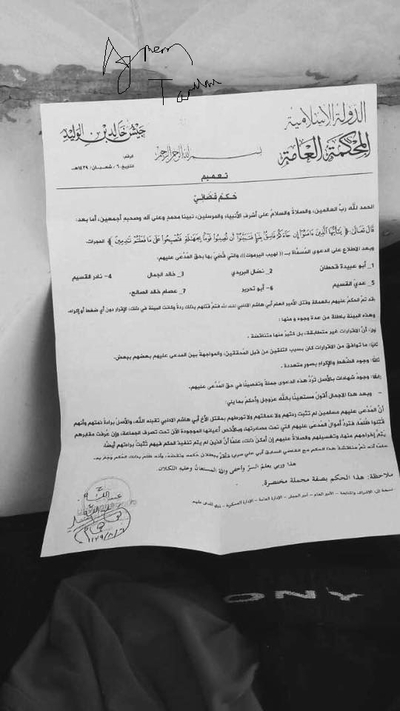 As this newly released document shows (whose authenticity I can vouch for from a local contact in Jamla and Qaysar Habib, the director of the 'Yarmouk Basin Media Office'), the case was in fact reviewed by the Islamic State, which has ruled that the men arrested and executed were innocent of the charges of treachery, apostasy and assassinating Abu Hashim al-Idlibi. Confirmed also in this document is that Abu Ali Saraya was head of the Jaysh Khalid bin al-Waleed court. Abu Ali Saraya himself has been in and out of prison multiple times on charges of treachery and (likely also now) on account of the ruling against Qahtan et al. he is said to have acknowledged was erroneous. On one account he is still in prison, on another he is apparently out of prison at the moment. This document is also significant as the first documentary proof of ties between the Islamic State and Jaysh Khalid bin al-Waleed. Below is the document translated in full. The Almighty has said: "Oh you who believe, if there comes to you an immoral one with information, investigate lest you harm a people by ignorance and you regret what you have done"- [Qur'an 49:6]. They were condemned for treachery and killing the general amir Abu Hashim al-Idlibi (may God accept him) so they were killed for that out of apostasy ruling and the evidence for that was: admission without any pressure or compulsion. 1. These admissions are not corroborating but rather many of them contradict each other. 2. What was agreed on from the admissions was because of instruction by the verifiers, and confrontation among the defendants. 3. The existence of pressure and compulsion in multiple ways. 4. The existence of witness testimonies that refute altogether this case against the defendants. The defendants are Muslims and their supposed apostasy and treachery were not proven, nor was it proven that they were involved in killing the brother Abu Hashim al-Idlibi (may God accept him) and the principle is their innocence and they were killed unjustly, so the wealth of the defendants that was confiscated is to be restored, in particular their possessions that are now under the disposition of the group, and if their graves are known they are to be excavated from them, washed and prayed for if possible. Let it be known that those against whom the ruling has not been implemented, their innocence is also established. Let it be known that this ruling has been discussed with Abu Ali Saraya the previous judge and he has admitted the falsehood of his ruling and that it is void, and that he committed wrong by that ruling and committed oppression by it. This is so and my Lord knows the secret and what is more hidden and God is the One whose help is to be sought and on Him is al-taklan. Note: this ruling is in condensed form. Cc. Oversight and tracking, general amir, amir of the army, general administration, military administration, relatives of the defendants.